UCSF's Millie Hughes-Fulford collects blood as part of her duties as a NASA astronaut conducting biomedical studies in space. (Phys.org)—Just a half-century after the first human ventured into space, commercial space travel—or "space tourism"—is quickly becoming a reality. A new UCSF study looks at the health implications of flying into outer space and suggests establishing health screening standards for private citizens who want to blast off. "We all have questions from patients related to air travel," said lead author S. Marlene Grenon, MD, MS, assistant professor of surgery at the UCSF Division of Vascular and Endovascular Surgery, and a researcher at the San Francisco VA Medical Center. "In the short future, we may be getting questions from our patients about space travel." Research on the impact of space on the human body started in 1957, when the U.S.S.R. initiated the space race with the launch of Sputnik 1, the first human-made object to be placed in orbit. Over the years, UCSF researchers have studied the impact of space on humans showing the effects—both physically and mentally—are profound. "In a zero-gravity outer-space environment, humans go through very unique physiological changes," Grenon explained. "They experience bone loss, muscle atrophy, increased risk of certain heart problems, decrease in immune function, kidney stones and motion sickness. These significant changes in the body and how it functions need to be considered." The study, published Thursday in the British Medical Journal, highlights the lack of understanding most physicians have about the impact of space travel on the body. Right now, there are no strict criteria on how to advise consumers about the health implications of commercial space travel. The researchers suggest having health screening standards as it becomes more popular. "The changes that occur in zero gravity happen for several reasons," Grenon said. "This includes a volume redistribution towards the chest and head, decrease use of the lower extremities, and the lack of gravitational stimuli on the cells." Millie Hughes-Fulford, PhD, a UCSF professor of biochemistry and biophysics and a medical investigator at the San Francisco VA Medical Center, has experienced first-hand the changes and challenges to the human body while in space. 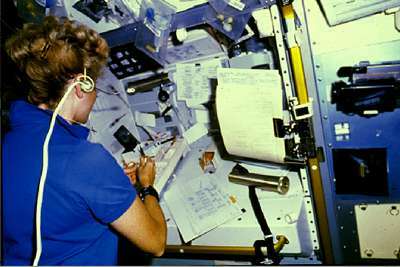 A molecular biologist, she was the first woman to travel into space as a working scientist on board the shuttle Columbia in 1991. Since then, she has become a world leader in exploring what happens to the immune system and bone cells when thrust into outer space. "It feels like you're on top of a roller coaster while you're in outer space. That feeling, in the pit of your stomach, is what you'll experience the entire time," said Hughes-Fulford, the study's senior author and one of the first female NASA astronauts. "You must check with your doctor to see if your heart and other vital organs are up for this type of adventure." An analysis by the Tauri group published by the Federal Aviation Administration estimates the demand for commercial space travel could be as high as 13,134 seats over the next 10 years, once the suborbital flight vehicles become available. The U.S. government continues to invest billions of dollars in space exploration, including extending the International Space Station, developing new spacecraft and studying Mars. Private companies such as Virgin Galactic are accepting suborbital flight reservations for $200,000. "Many of us have been fascinated with outer space since we were children," Hughes-Fulford said. "Science fiction books and movies have planted that seed and allowed us to dream about blasting off." Just as there are resources available for the clinician who has a patient traveling on commercial aircraft, so are there resources and standards documents being developed for space travelers who have not undergone the extensive selection process that's the current norm for professional astronauts. For example, the Center for Excellence for Commercial Space Transportation at the University of Texas Medical Branch discusses recommendations for crew medical standards for suborbital flight, as well as recommendations for passenger acceptance guidelines for commercial space operators. 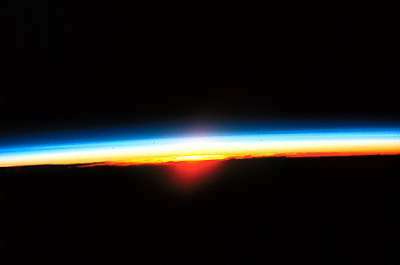 A rarely-seen view of a sunrise from outer space. "In the future, I think we can expect space medicine doctors will be needed specifically for the commercial space sector as demand increases," Grenon said. "And these experts would likely link with specialists on earth in different fields such as cardiology, vascular surgery or neurology when it comes to specific questions on a condition in space or recommendations on how to best manage a medical problem prior to a flight." For Hughes-Fulford, who has sent several experiments into space, commercial space travel is a logical next step in space exploration. "It's the nature of mankind to push limits. I definitely see us traveling to other planets fairly regularly in the near future," she said. "At UCSF, we're looking at molecular medicine and precision medicine. That was a dream 20 years ago and it's a reality now. So why not go forward and not be afraid?" Grenon is the lead author of the paper; co-authors include Hughes-Fulford; Joan Saary of the University of Toronto; Gary Gray of the Canadian Space Agency; and James M. Vanderploeg of the University of Texas Medical Branch.